Comprehensive Guide to Purchasing Wood Blinds from BlindsOnLine.com - BlindsOnLine.com Inc. However, the team at BlindsOnLine.com believes that it is important for all customers to make an informed decision on what they put on their windows prior to making a purchase; after all, windows are one of the most common features on a home. That is why they have put together a wood blinds buying guide, complete with detailed information to expand your knowledge of their products. What are the main advantages of purchasing shutter blinds? One of the primary reasons that homeowners choose wooden blinds is because they are more attractive than many other alternatives on the market. Their wooden composition adds a rustic, but charming, appeal to the home. Customers who are interested in more than just the natural appearance of wood can also stain or paint their blinds to complement any décor. 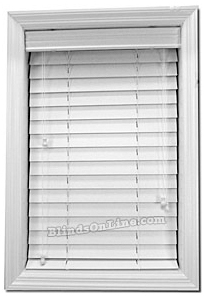 Although BlindsOnLine.com’s shutter blinds are all manufactured from basswood, they still offer homeowners a wide range of options. Currently, BlindsOnLine.com offers customers Economy 2”, Premium 2”, 2 ½” Shutter Style, and Premium 1” wood blind products. In addition, customers can also choose to purchase unfinished blinds and customize them with painted or stained finishes. Unlike fabric, vinyl, plastic, or other materials, wood is very thick and is, therefore, perfect for creating a private home environment and keeping out unwanted sunlight when closed. Moreover, wood blinds also produce a comfortable indoor atmosphere by providing insulation from both the heat and the cold. As mentioned above, wooden shutter blinds act as insulators and although they may seem like an expensive option at first, they are really quite affordable. 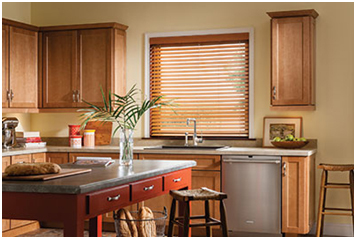 Wood blinds are extremely durable and can last for a very long time. What this means is that, over time, customers can actually save money on their heating and cooling bills by choosing to purchase wood blinds. At BlindsOnLine.com, staff know that oftentimes it may be difficult to install blinds, shades, or curtains to windows, which is why they offer educational installation guides on their website. But with wooden blinds, the installation process is simple. This is mainly because wooden blinds are not particularly fragile and can be installed by homeowners without worry. However, customers who want to ensure a perfect fit and don’t mind spending a little more money on their windows are encouraged to contact a professional company that will install the blinds for them. 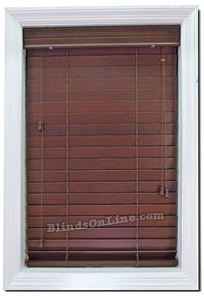 What are the different wood blind options available from BlindsOnLine.com? These types of blinds offer customers complete UV protection in their home without having to sacrifice style. Offered in 5 different colors (cherry v712, golden oak v709, oak v707, eggshell v703, and white v700) Economy 2” blinds offer customers a wide range of customization options. Premium 2” wood blinds offer customers even more design options with 17 different colors and 24 different fabric colors. Manufactured from the finest basswood, these blinds can be fitted to a wide range of window sizes. They also feature a 3” decorative crown molding valance. Like the Premium 2” wood blinds, the Premium 1” are virtually similar in every aspect: they come in 17 different colors, fit all types of window sizes, and come in painted/stained finishes. The major difference between these two options is aesthetics; the Premium 1” are much smaller in size than the Premium 2”. Made from the finest wood, 2 ½” shutter style wood blinds come in 9 different painted or stained finishes and include a 3” decorative crown molding as well as all the necessary mounting hardware. 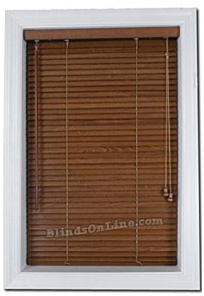 As the name states, these blinds are 2 ½” – the widest size available from BlindsOnLine.com.